1/6 You've been a vegetarian for many years—what made you start? I started on Chinese New Year in 2001, so it’s been a full 17 years. At the time, it was very simple—I just didn’t want to cause any suffering [to the animals] for my personal enjoyment of food. Soon after that, I started reading anything I could on the topic and it became more about the health and sustainability aspects. That’s when it really surprised and stunned me—how the animal agriculture industry could do so much damage to the planet, which is to us, basically. 2/6 What is the most pressing green issue for 2018? On the environmental side, climate change is obviously not getting any better. On the other end, we have general food safety. People really need to be educated about what they’re eating. The overdosage of hormones and antibiotics in food, particularly in meat, is beyond excessive. Doctors these days are seeing people in their 30s getting cancer at a much more frequent rate, with symptoms that they usually only see in people over 60. To them, there’s no doubt that food is a key factor in people’s health deteriorating. 3/6 Hong Kongers really love their meat—how do you convince them to choose otherwise? We actually created Green Common to break the stigma [of vegetarian food]. Taste makes a big difference, and a lot of what we do at Green Common is not just bringing in these [veggie] brands or food products, but tailoring it to Asian palettes. That’s why you’ll see Hainan chicken (we call it the ‘Runaway Chicken’) and the more recent, Vietnamese pho (aka. the ‘Good Pho You’). If you ask carnivores to go from eating steak to kale and quinoa—not everyone can make the jump, so these new products would be a good entry point. Plus, it doesn’t need to be a zero or 100 type of thing. There are a lot of intermediate steps, whether they do it one day or one meal at a time. Ultimately, it’s a combination of taste, variety, awareness and trend. It’s becoming very apparent now that eating well and being more conscious about plant-based food is a global mega-trend. 4/6 What are three tips to start eating green? First, instead of eating a steak, try the Beyond burger. In general, red meat and processed meats are the worst in terms of environmental impact and health. Second, avoid dairy products as there are so many better choices. People have no idea—I would advise everyone to just go on YouTube to see how milk is produced nowadays in animal agriculture or factory farms. They’d be stunned by what they saw. The third is to try more superfoods. Obviously, a lot more people are eating kale, avocado or beetroot, but the variety of vegetables and plants have really expanded tremendously. It’s not what people used to think, which is tofu, tofu and more tofu. 5/6 What are your personal favourite items from Green Common? We recently brought in a new brand called Vegan Rob’s, who make asparagus chips, spinach chips and cauliflower puffs—they’re my favourite snack right now. I always have almond milk, coconut water and hydrogen water in my fridge, which is not only good for a natural boost of energy but great for hangovers (although I don’t drink). You’ll also find Beyond Meat and Gardein in my fridge—two brands of plant-protein that you can use in Chinese and Western cooking. I sometimes use the Beyond chicken or Gardein chicken strips and mix it with kimchi. 6/6 What’s next for Green Monday in 2018? Green Common is expanding. 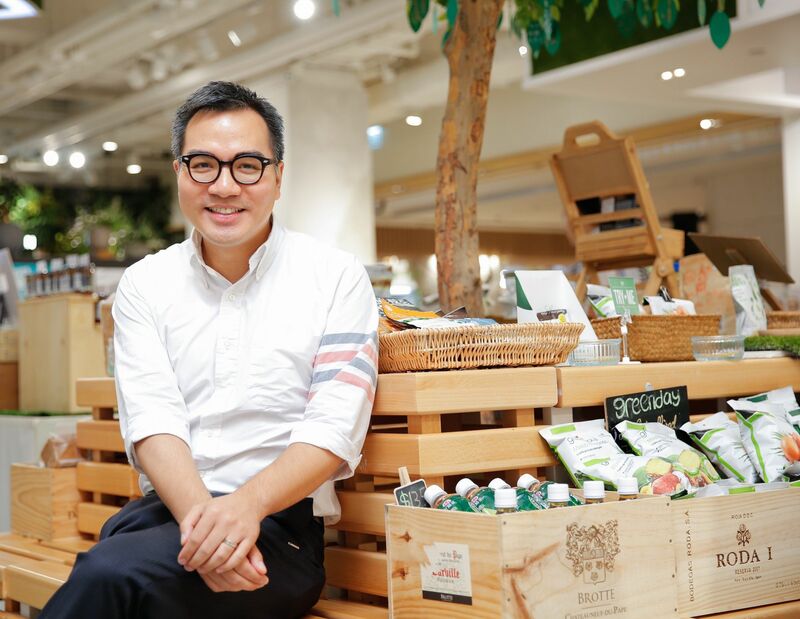 We currently have six stores in Hong Kong and we’ll continue to bring in new brands and health and wellness concepts (like the launch of JUST Scramble in January, an exciting new vegan egg product). On the Green Monday side, we’re up to 35 countries now as more corporations, schools and organisations adopt Green Monday. Lastly, we have a few exciting initiatives coming up where we'll engage with Hollywood megastars in Asia (I can't share anything yet, but stay tuned for more info!). Follow @greenmonday_david for more plant-based meal inspiration, and visit Green Monday and Green Common for more information.